Make any room in your home stand out when you order new luxury vinyl flooring from our reputable store. Our sales team proudly offers a wide variety of product options that fit in any room. Whether you dream of a new look for your kitchen, bedroom, or bathroom, choosing us for your luxury vinyl flooring installation will give you a fresh style to fit any space. Our collection includes eye-catching styles from some of the top brands on the market today. Shop with us at our local showroom to learn how our materials can make your space pop. When it comes to your home, you deserve the very best. If you are looking to upgrade your space, don't leave your services in the hands of just anyone. At our showroom, we carry a full selection of luxury vinyl tile and vinyl plank for homes throughout the region. No matter what your personal taste preferences are, we have an option that you are sure to love. With a purchase of our products, you are free to request a luxury vinyl flooring installation. Our experienced team of contractors works in spaces of any size to complete your job to the highest standard. When you turn to us for service, we focus on the details to ensure that your project is completed the right way the first time. We work carefully in rooms of any size for the proper installation that impacts the looks and longevity of your new LVT floors. If it has been years since the last time you remodeled your home, it may be time for a change. A new set of LVT can deliver a bold new look without the need for a lengthy renovation project. Shop with us to explore top options in the industry. We proudly carry a full inventory of products from top brands on the market, including COREtec, Armstrong, Shaw, Mohawk, and Mannington. With these stylish and durable floors, you will be able to update your rooms to fit your own personal style. Whether you are looking for a classic or contemporary look, you will find something you love at our local showroom. 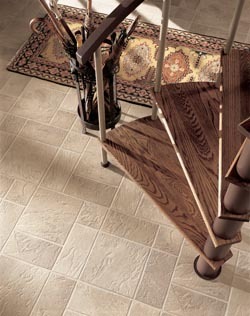 Luxury vinyl tile is available in a wide variety of styles and colors. With its eye-catching looks and strong resistance to chips and cracks, this material is a popular option for use in kitchens and bathrooms. In addition, this versatile product is capable of mimicking natural stone, slate, and ceramic tiling. Our sales team is happy to help you choose the perfect color and texture for any room. Do you dream of adding the regal style of hardwood to your home? If you are looking for an alternative to this popular material, consider luxury vinyl plank for your flooring. This stunning material is built to last against regular wear and tear. Whether you have children or pets, choosing this flooring will give you years of classic looks without the need for extensive cleaning and maintenance. Contact us to order luxury vinyl flooring for any part of your home. We proudly serve clients throughout Atascadero, Paso Robles, Templeton, Santa Margarita, and San Miguel, California, plus the surrounding areas.